An essential when working with canvas and other textiles, a correctly specified quality eyelets and rings can make all the difference to your finished product. 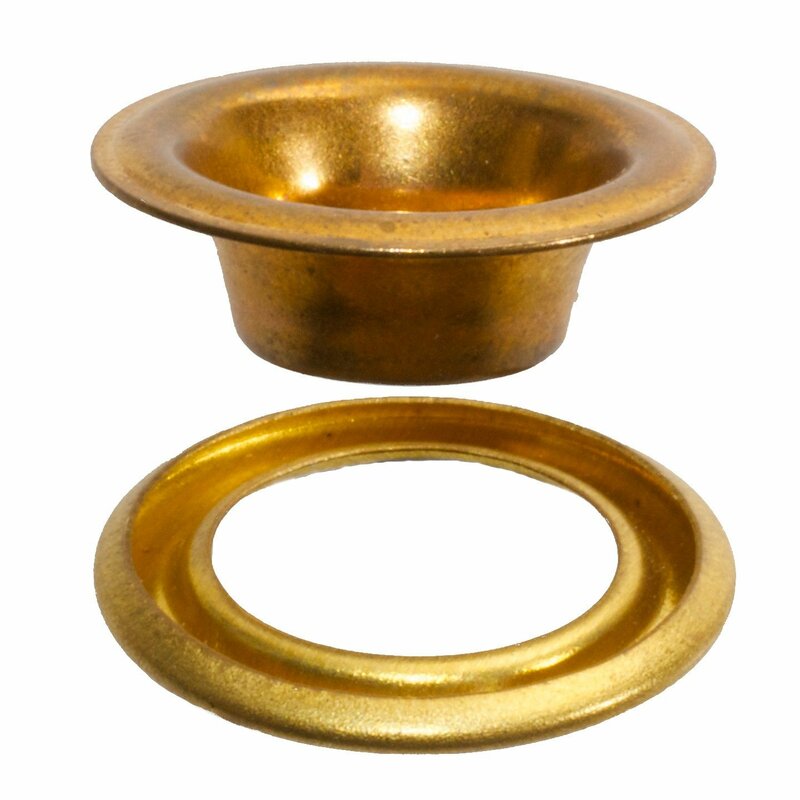 OPAS grommets and washers are manufactured to the highest standards and this huge range of sizes and styles can usually be supplied from stock. Grommets and washers can be set both by low cost hand punches and dies, or by bench presses. If you need any help on the best product and setting method for your application, OPAS are happy to provide professional expert advice. Brass eyelet and ring manufactured to BS3102. Outside dia 9.5mm, Inside dia 5.16mm, Barrel length 4.35mm. Nickel finish also available from stock. Brass eyelet and ring manufactured to BS3102. Outside dia 11mm, Inside dia 6.75mm, Barrel length 5.16mm. Nickel finish also available from stock. Brass eyelet and ring manufactured to BS3102. Outside dia 12.7mm, Inside dia 7.14mm, Barrel length 5.56mm. Nickel finish also available from stock. Brass eyelet and ring manufactured to BS3102. Outside dia 14.29mm, Inside dia 7.94mm, Barrel length 5.95mm. Nickel finish also available from stock. Brass eyelet and ring manufactured to BS3102. Outside dia 15.88mm, Inside dia 8.73mm, Barrel length 5.95mm. Nickel finish also available from stock. Brass eyelet and ring manufactured to BS3102 delivering a roll form set. Outside dia 17.46mm, Inside dia 9.53mm, Barrel length 6.35mm. Nickel finish also available from stock. Brass eyelet and ring manufactured to BS3102. Outside dia 22.23mm, Inside dia 11.91mm, Barrel length 7.54mm. Nickel finish also available from stock. Brass eyelet and ring manufactured to BS3102. Outside dia 23.81mm, Inside dia 12.70mm, Barrel length 7.94mm. Nickel finish also available from stock. Brass eyelet and ring manufactured to BS3102. Outside dia 25.40mm, Inside dia 14.29mm, Barrel length 8.33mm. Nickel finish also available from stock. Brass eyelet and ring manufactured to BS3102. Outside dia 28.58mm, Inside dia 15.88mm, Barrel length 8.73mm. Nickel finish also available from stock. Brass eyelet and ring manufactured to BS3102. Outside dia 31.75mm, Inside dia 17.46mm, Barrel length 9.53mm. Nickel finish also available from stock. Brass eyelet and ring manufactured to BS3102. Outside dia 34.93mm, Inside dia 19.05mm, Barrel length 10.32mm. Nickel finish also available from stock. Brass eyelet and ring manufactured to BS3102. Outside dia 38.10mm, Inside dia 20.64mm, Barrel length 10.72mm. Nickel finish also available from stock. Brass eyelet and ring manufactured to BS3102. Outside dia 44.45mm, Inside dia 31.75mm, Barrel length 12.70mm. Nickel finish also available from stock.